My calendar ain't John Cleese so I don't want no spam. 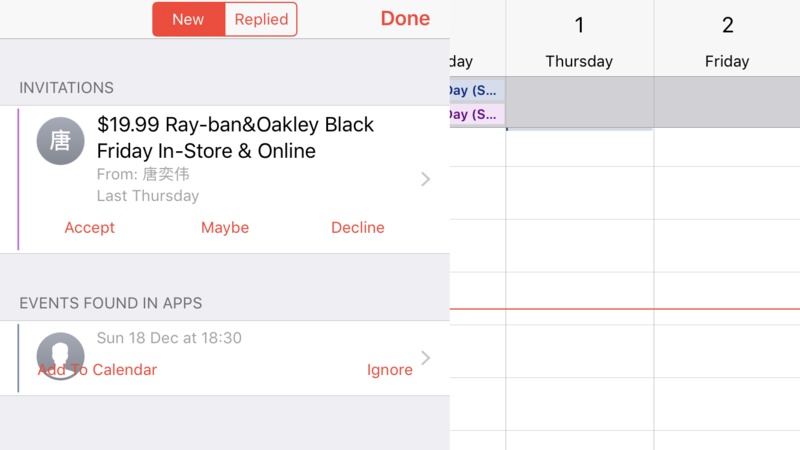 If you rely on iCloud typically to back up important events, information and other types of data, you might have seen some pretty strange (and annoying) spam on your Calendar over the last week or so. They're "invitations" to shop for specific items, only they're not real invitations at all -- they're spam. They appear as ads for items in personal iCloud calendars with options for you to Accept, say Maybe, or Decline them in their entirety at first. There doesn't appear to be a way for you to delete them from your calendar or at least an easy way. In fact choosing any of these options lets the spammer know that your account is active and you'll soon be flooded with even more suspect offers. Instead, try one of these two methods that will get the spam out of your face without letting spammers know they've pinged an active account. Method 1: Taking care of spam from the calendar app. Taking any action with spam offers directly will notify the spammer that your iCloud account is indeed active and ready for more juicy spam. Instead, we're going to move them to a different calendar and then delete it, taking the spam with it. 1. Open Calendar and select "Calendars" from the bottom of the screen. 2. Select Edit and then "Add Calendars." 3. Give the calendar any name you want, just make sure it's one you can recognize. Then click "Done" and return to the regular Calendar screen. 4. Select any Spam invitations and move them to the new calendar you've created. 5. Select Calendars at the bottom of the screen again and then hit "i" next to the calendar you placed all the spam in. 6. On the next screen, select "Delete Calendar" at the bottom of the screen. Once you've deleted the calendar you placed all the spam in, it will disappear along with the deleted calendar. Method 2: Change Calendar settings in iCloud. 1. Log into iCloud via any desktop web browser. 2. Open the Calendar and click the cog in the bottom left corner. 3. Go to "Preferences" and then "Advanced" and click "Receive event invitations as Email." 4. The event invitations will come to the email you've registered for iCloud with, and you can delete them from your email inbox. Choosing either of these two methods will let you get rid of those annoying spam events without notifying spammers that your account is active. Once you've chosen one of them, you can be sure that you won't receive an increased amount of spam invites, and your account will remain anonymous.